Athens will not be photographed. Any attempt to take its picture is insipid, flawed, or ineffective. The city resists all direct acts of recording, drawing, or narrating it, much like its public space resists transformation. The overwhelming commons of contemporary Athens is inertia. Layers of aborted metamorphoses, attempted plans, half-squares, ephemeral architecture, once-specific art, everyday rituals, casual play, informal construction, straddle parking, urban residue, slogan graffiti and spotted marks bury themselves on top one another in constant, oblivious, democratic landfill. In there, no trace is more significant than another; no building needs to stand out; the collective engulfs the individual; dust and fatigue mix with clarity and vigor; and grand projects are equal to natural disasters. The Athenian palimpsest, from brown dark basement to white antenna terrace, demands the invention of new recording apparatuses: scanners of the ground, of density, and of people. Successful representations of Athens necessitate the invention of such devices: narrative techniques, artistic modes, design systems that work through, inside, up close and beyond the city, rather than head on or against it. Thus Seferis (the novelist), Miller, Tsirkas, Papaioannou or Tschumi miss the point because they directly engage Athens; whilst Seferis (the poet), Pikionis, Tsarouchis, Hatzidakis, Zenetos, Tachtsis, Karapanou, Papoulias, Stefani or Giannaris leave us great Athenian works through indirect focus, embedding, distance, or scan, ultimately creating new recordings of the city. The descriptive mode of the former group fails; the elliptic, close-frame, irreverent, collage mode of the latter creates personal spaces and critical stories, transforming inertia into light. The old gods of Athens are subterranean, of collaged identity; a snake-man and a virgin-warrior girl. Athenian myths reside inside the rocks, on alignments of various size hills and then, through violent refraction, to the sea. Likewise, contemporary Athenian places of intense public encounter are non-standard urban spaces, rather, semi-public, underground, edge places – or the beach. The vibrant crowd that gathers in fleemarkets, feasts of saints, doghouse clubs, the Pnyx or the beaches of Attica and the islands creates its own residue, a heterotopia, a refuge from and into the city. Unlike Rome’s sectional curation of continuous, ductile history (whence the ceiling of the Pantheon becomes St. Peter’s Throne), Athens works abstractly and in plan. Neither an open-air museum nor a smooth working landscape, the Athenian palimpsest is fundamentally unreadable. Scattered openings of historical continuity are exceptions enforcing its rules of burial and forgetting. Athenian history rises through rifts and fault lines, between entropy and disaster; its meaningful open sections are collages where, by the violent juxtaposition of random fragments (or identities), a third, irreverent, fleeting new meaning emerges; surprises in the post-industrial ruin of Modernism that carpets over the myth of the Attic Landscape. So: Athens will not be photographed by any standard camera. Inert, dense, collage, palimpsest, refracting, flattening, it eludes and defeats straightforward picturing: urban photography, large format landscape, aerial, street, architectural photography or crisis reportage produce non-starter, cliché images of the city. A successful Athenian imaging project requires a different set of views: ground-up, backlit, indirect. Once upon a time, the stereotypical journey to the East and its concurrent process of distancing and disambiguation from the (Western) object, ended in Athens. Later, it started here. This was a journey of self-discovery, subject to standard movements and acts of recording. To change, or capture change, the traveler, or intervening agent, first hit, then dwelled in the Athenian ground; he then drew a path in it; his own walkscape in the city. By acts of intense refraction, blinded by the Attic light and disturbed in memory, he took refuge to the beach or in a hidden courtyard, and in so doing looked away from the city; and in the end, knee-deep in Athenian turf, in the shadow of a citrus or olive tree, away from Athens, the possibility of a picture opened up. A crack in the surface of the everyday that would become a point of view. Like any other place, Athens is consumed by its image. Its method of consumption is the monumental media montage – a constructed, composite, animate vision that dominates the public sphere. The major part of this montage is the Acropolis: a monument to inertia, ultimate condenser of a promenade, object of refraction: a timeless postcard for the city built on top of it, commanding its appearance, affecting every single impression of it. 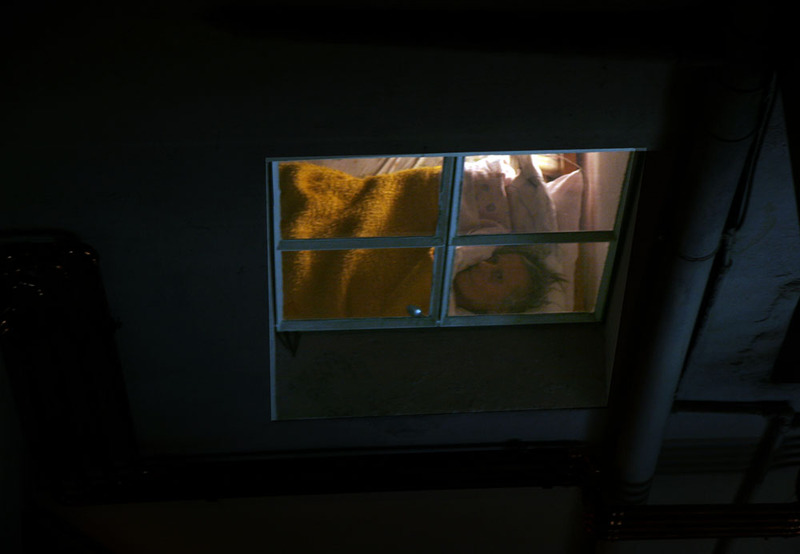 The second part of the montage, ubiquitously undercurrent, is the constant stream of crisis broadcast, epitomized both by Greek TV windows – couplets, triplets or sextets of talking heads and archive footage – and by recurring foreign reports “from the capital” – a concerned, patronizing voiceover against disaster footage: a myopic, cacophonous, hysterical carpet of monologue, misery and riot, sensationally spreading the picture and atmosphere of the constant crisis into the Athenian and European collective unconscious. The shape and structure of the montage mimics the urban form of Athens – it layers over the city juxtaposing tourism with riots, shopping with slums, nature with pollution, leisure with anxiety. If the Acropolis eclipses the image of the city, the hyper-media stream covers it in an anxious, meaningless, audiovisual carpet of mental white noise. Media and monuments also eclipse Athenian public space. Constantly shrinking, inherently degraded, flooded, occupied, worked and contested by immigrants, freelancers and fringe political groups, abandoned by the middle class in favor of new shopping and parking in diffuse Attica, dropped by the state as the civic core of the republic, controlled and consumable, no longer a place of encounter where the unexpected is probable, the pre-Olympic mirage of an all-inclusive, top-down, urban-designed, 20th Century Athenian public space vanishes under the weight of the constant crisis. New common spaces emerge in its stead: bottom-up, spontaneous and urgently revived leftover spaces of the inner city where communities gather in order to breathe. 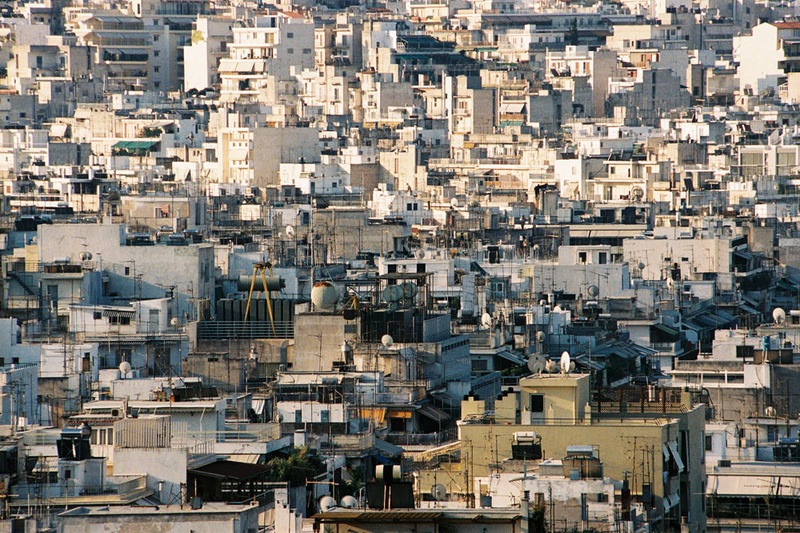 Taking on quintessential Athenian informality, malleability, negotiability and hospitality, the fundamental value of these emerging common spaces is that they are much less mediated, and therefore exploitable, than any other urban space; they thus look to the social production and grueling preservation of extinct communal resources. As sparse and random as historic resonance, these common spaces are islands yet to form an urban archipelago, engulfed by the monumental media montage, bracing against it through their inconspicuousness and personal scale. The mental movie of contemporary Athenians contains all the above: postcard monuments, crisis broadcast, contested public and safe common space, inertia, palimpsest, entropy, disaster, persecuted immigrants, the embattled middle class, fringe politics, clement weather, weeks of recurring anxiety, flashes of joyous relief, underground agoras, and the beach. This mental movie defines the zeitgeist; it plays in continuous loop; it is overwhelmingly anxious, occasionally depressed, locked in a frozen, speculative present, short-sighted and without an ending. Like all bad movies, it lacks structure and, above all, a good story. 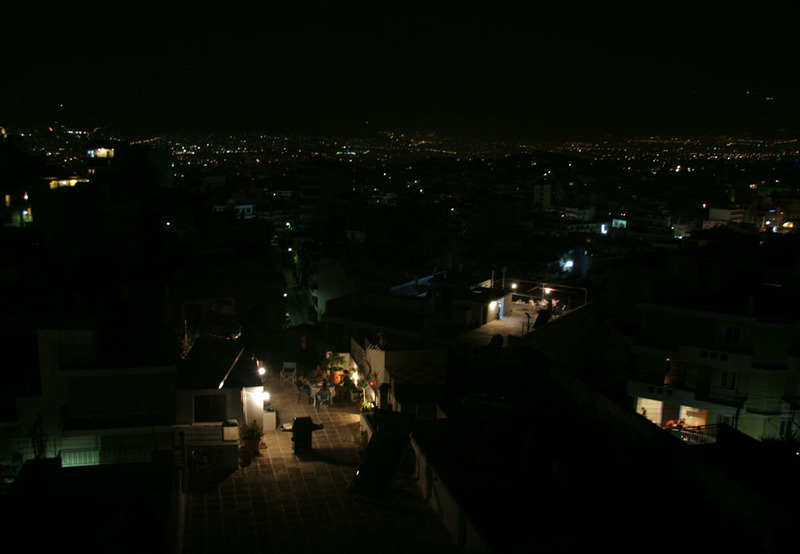 Finding a point of view to Athens necessarily requires pausing this movie: stepping out of the white noise of the present, away from first-hand urban representations: switching from the state of mind of the constant crisis to some type of inner distance. Relinquishing the lost ideal of public space to the collage-identity found in the rifts and fault-lines of the Athenian palimpsest. Visualizing, not the city, but within it; not the crisis, but its feelings, through gaps of meaning. Ground-up, backlit and indirect, this point of view may recapture the urgency, the latent eventfulness of common space, right before or after a tipping point. The state of mind that anything, or at least something, is probable. 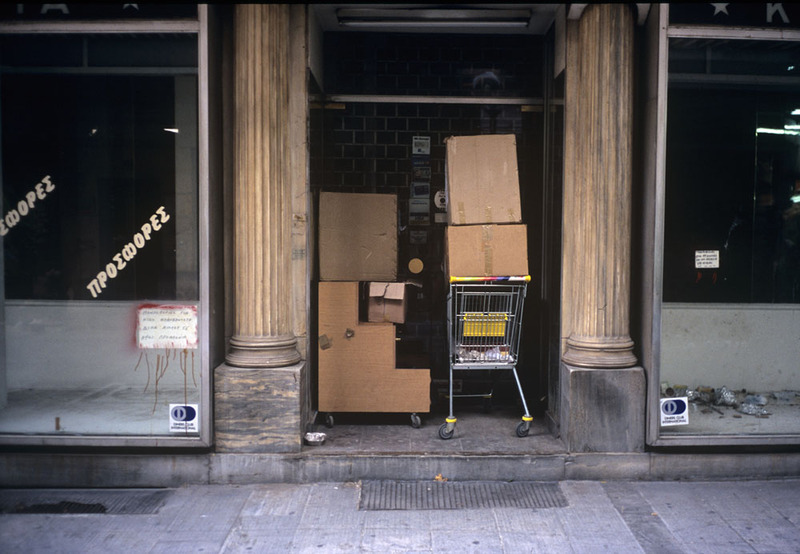 The work of the three photographers accompanying this essay – Yorgos Prinos, from the series “Eclipse,” Georges Salameh, from the series “Athens I’m Listening” and Chrissou Voulgari, from the series “Rear Window” – speaks about the mirage of 20th Century public space as a space of unrealized encounter, exhausted consumption and manipulated spectacle, a place that no longer stands as it was visualized, theorized and designed by the European generation of the ‘90s – a space that no longer exists. Defined by their particular historical moment and the Ethos, the photographs also point to the emergence of common space: its random, vibrant, informal existence in-between the city and its monumental media montage. 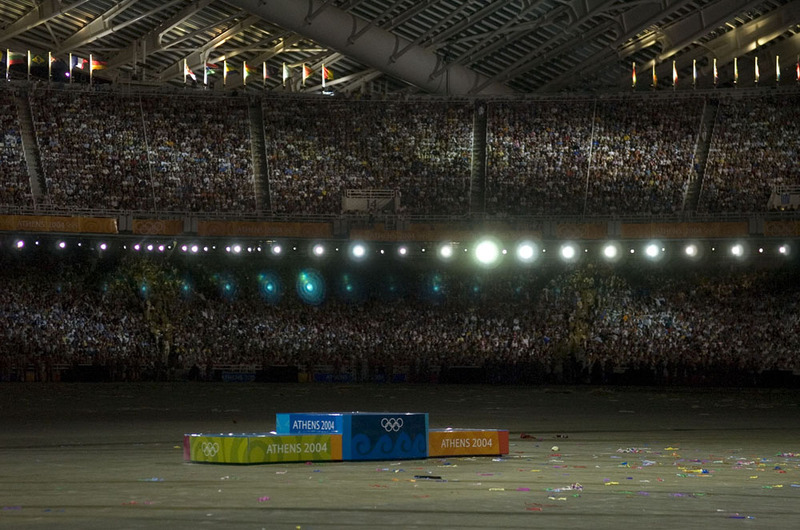 They tell an elliptic story of transformation that begins literally a few seconds after the 2004 Olympic Games and ends with the student uprising and concurrent riots of December 2008: a mutation of urban identity without its new collage of faces. 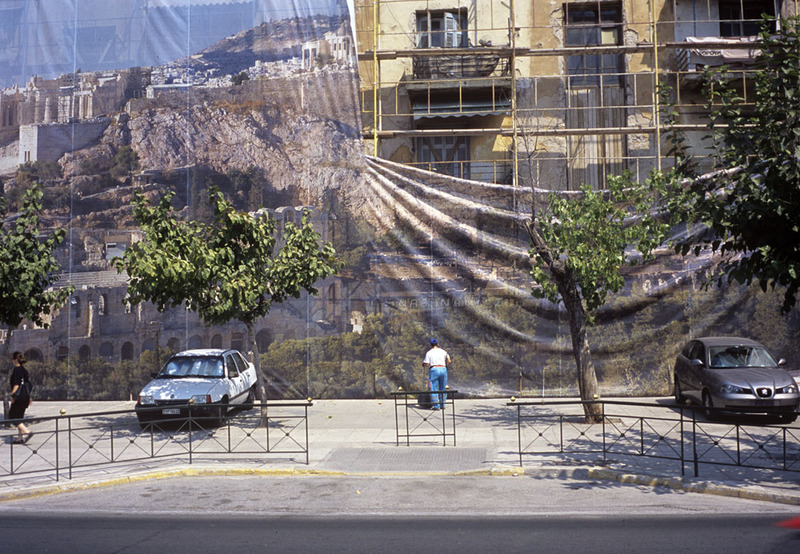 The images are ambiguous, latently eventful, appropriately withdrawn from, yet deeply embedded in, the city of Athens; their points of view are publicly inaccessible spaces; they cause emotion through breaks of meaning; they define and prefigure the feelings of the constant crisis, right before (or after) its tipping point. Latent emptiness, distant sadness, sudden recognition, subdued anger, veiled pity, restrained fear, masked despair, rising shame, hurried yet delirious joy: the mental movie of contemporary Athens, visually powerful, pervasive, noisy, lacking in structure and narrative, contains and muffles all these emotions in its white noise carpet. The past fifteen years, from the end of the nineties to the present, emerge through these six photos as a state of transit between two identities, one a romantic mirage of the 20th Century, the other a dystopic yet savagely beautiful collage of the 21st. This transit is almost over. It will soon produce a new picture of the city. The magic scanner, the device that will look straight into people, away from monuments and media, and in so doing create a new mental movie, with structure, story and identity – is under construction. It is now clear that its project operates, not in empty lots, but in the common spaces of the inner city as much as in the communal, leftover spaces of the Greek polykatoikia; that its fuel is virtual and physical, looking to the networked global city. We may now look to those who told great Athenian stories, for the techniques, modes, and systems they used, bracing for the brave new world ahead. Seferis, rediscovering his back yard; Tsarouchis, the courtyards and the kafeneion; Pikionis, collaging the East into Attica, designing between performance, painting and masonry; Hatzidakis, singing in the dreamstate of the everyday; Zenetos, structuring site-specific science-fiction; Tachtsis, broadcasting a neighbor’s mental radio; Karapanou, speaking the mind of a child; Papoulias, exorcising the act of building through deep digging in the mythic underground; Stefani, ghosting a monument with vulgar-yet-precious found footage; Giannaris, sitting at the edge of the city. You can never look Athena in the eye: even if you managed to endure the panoply and petrifying shawl, her gaze is too blue to behold, and results in mortal blindness. The Goddess appears to those she favors always in disguise, and to those she combats in full garb. A mirage, she guards the city in more than ten incarnations, switching its name to plural: Athinai, engulfed yet unphased by the white noise of the constant crisis, ineluctably modal, an image impossible to picture. She has already dispatched its postcard to the world. Athens will not be photographed: it guards its multiple, collage identity deep inside the palimpsest, protected by inertia, gaps of meaning and countless rocks: she’s safe and no one knows it. Published in Made in Athens, Greek Participation at the Biennale di Venezia 2012, Catalogue, eds. Panos Dragonas, Anna Skiada. George Seferis, Six Nights on the Acropolis, trans. Susan Matthias. (2007) Athens: Attica Editions; Henry Miller, The Colossus of Maroussi. (1947) San Francisco: Colt Press; Stratis Tsirkas, Η χαμένη Άνοιξη. (1976) Αθήνα: Κέδρος; Dimitris Papaioannou, Mesa. Performance. (13/4-15/7/2011) Athens: Pallas Theatre, Elliniki Theamaton; Bernard Tschumi’s & Michael Fotiadis’ Acropolis Museum opened in Athens on June 21, 2009. George Seferis, Three Secret Poems in Complete Poems, trans. Edmund Keeley and Philip Sherrard. (1995) London: Anvil Press Poetry; Dimitri Pikionis’ landscaping work in pedestrian areas around the Acropolis and Filopappou hills was completed between 1954-7; Yannis Tsarouchis’ paintings of the period of 1954-8 focused on the Athenian everyday; Manos Hatzdakis, a major 20th century Greek composer; Takis Zenetos’ major works of urban architecture such as the Fix Factory, the Lycabettus Theatre, the Agios Demetrios School as well as his Electronic Urbanism studies were produced in the 60s and 70s; Kostas Tachtsis, The Third Wedding Wreath, trans. John Chioles. (1985) Athens: Hermes; Margarita Karapanou, Kassandra and the Wolf, trans. N.C. Germanacos. (2009) Athens: Clockroot Books; Christos Papoulias’ critical proposal for the Erichthonean Museum of the Acropolis was completed in 1991; Eva Stefani, Athinai, 36’ (1995) and Acropolis, 46’, 25’ (2001); Constantine Yannaris, From the Edge of the City, 94’ (1998).